President Cyril Ramaphosa still has the cloud of the Marikana Massacre over his head and the Congress of South African Trade Unions (Cosatu) should reconsider his address at the congress's main rally, said the Association of Mineworkers and Construction Union (AMCU). AMCU on Monday issued a statement indicating it would not commemorate Workers Day on May 1. Instead it wants August 12 to be declared a public holiday, in commemoration of the 34 striking mineworkers killed by the police in Marikana on that day, it said. The union took aim at Ramaphosa who is expected to address Cosatu’s main rally on Tuesday at Nelson Mandela Bay, Eastern Cape. Ramaphosa is expected to receive a warm welcome by Cosatu members, this is in contrast to former president Jacob Zuma who was prevented from speaking at the Workers Day event in 2017 by a jeering crowd who wanted him to resign. “If Cosatu was consistent they would use the same principle approach to review the address by the current State President; a champion in neo-liberal minimum wage as well as oppressive labour relations amendments and a conflicted Lonmin (Marikana) Massacre associate who is yet to tender his apology,” AMCU said. Ramaphosa was a Lonmin non-executive board member in 2012 and famously asked the police to use “concomitant action” against striking mineworkers. He was cleared of wrongdoing by the Farlam Commission of Inquiry. 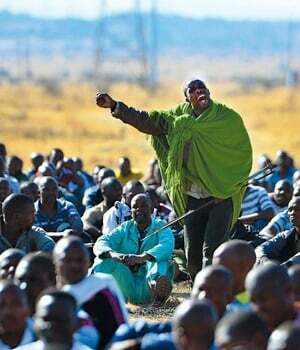 AMCU shot to prominence in the aftermath of Marikana in 2012 and is currently the majority union on the Platinum Belt. “Workers Day must commemorate our struggle. Lonmin (Marikana) Massacre is the epitome of our struggle. 16 August must be our Workers Day. Government must declare 16 August as South African workers day in commemoration of the Lonmin Marikana massacre,” the union said in a statement on Monday. The history of May Day or Labour Day - as it is sometimes times known - began in 1884 when Canadian and American unions demanded that an eight hour work day be instituted from May 1, 1886. Ahead of the 100th anniversary, the Congress of South African Trade Unions (Cosatu) called for a mass stay-away on May 1, 1986 and held several rallies, despite banning orders by the apartheid government. AMCU said that “history is dynamic” and there are “compelling grounds to review this date in line with recent experiences in our history”. The union also pointed to other countries such as the US which celebrates Labour Day in September. The South African Federation of Trade Union (Saftu) will commemorate Workers Day in Bloemfontein while general secretary Zwelinzima Vavi will address a smaller rally in Nelson Mandela Bay. Saftu - the only large labour federation outside of Nedlac- held a one day stay-away on Wednesday demanding a higher minimum wage and the scrapping of changes to the labour laws.